Write your best story. Change your life. Astound the world. Stories live and die on their scene structure. A great plot—even a well-structured great plot—won’t be able to stand if its individual scenes are floundering with no clear sense of purpose and direction in the overall story. Dwight V. Swain engineered the classic approach to scene structure, which breaks down each scene into integers of action and reaction—or, as Swain calls them, scene and sequel. Each of those halves is then broken down further into three parts each (scene: goal, conflict, disaster; sequel: reaction, dilemma, decision). This approach creates a solid chain of cause and effect that ensures each piece is integral in driving your overall plot forward. But it’s not the only way to think about scene structure. Today, I’m going to show you a secondary scene structure tool you can bring in as a support for Swain’s comprehensive, but occasionally mechanical overview of your story’s most fundamental building blocks. What if We Thought of Scene Structure As a Series of Questions and Answers? So there I was, sitting outside at my rustic writing table (before the weather got too cold, of course), working on my scene outline for my portal fantasy sequel Dreambreaker. As always when mapping out scenes, I was paying strict attention to the six parts of Swain’s scene structure. The view from above when I’m figuring out scene structure in my outline. The protagonist’s goal must, of course, be obstructed by pertinent conflict, which must then lead to a directly related scene outcome/disaster. Everything’s connected in a beautiful straight line. Except for when it’s not. In the helter-skelter of real-time plots, in which you’ve likely got two or three different aspects of conflict all happening concurrently, it can be incredibly easy to fumble the continuity of a scene, despite the fabulous tools offered by Swain’s method. I immediately sat back and realized this idea had given me the ability to look at each scene through an entirely different perspective. One of the easiest ways to make sure any scene’s opening gambit is a direct line leading through the intermediary chaos of any number of conflicts straight to a pertinent scene climax is—you guessed it—to make sure the question raised in the scene’s beginning is the same question that finds an answer in the scene’s end. When you make your scene list, identify the meso story question for each scene. This will help you remember what each scene is all about and what you need to accomplish in that scene. What Is a “Scene Structure Question”? On one level, we might posit that a story itself is in fact a question. Generally, this question is “What’s going to happen?” When this question finds its definitive answer in the story’s climax, the story is over. That same pattern is repeated, on a smaller level, in every scene. The question you need to be asking at the beginning of every scene is: “What’s going to happen?” But, of course, to be useful, you must then refine this question into something unique to each specific scene. Will Mr. Bennett introduce himself to the eligible Mr. Bingley? Will Elizabeth see Mr. Darcy when she visits his Pemberley estate? Will Elizabeth cave to Lady Catherine’s insulting demands that she refuse Mr. Darcy’s hand? At first glance, all of these questions may seem to be just general queries within the narrative. But not so. A closer look at this familiar story shows us that each of these questions is pertinent to driving a very specific scene. Even when the protagonist and/or the readers are not immediately aware of the specific nature of the question, once we reach each scene’s answer, we can identify what question was driving the scene from the very start. When using Swain’s approach to structure, you can begin planning a scene by either identifying its goal and following it through to its conclusion—or by choosing the scene outcome/disaster you want to create and then forming the correct goal to lead the character to this ending. Same goes when using questions and answers to frame your scene structure. You can begin with either the question or the answer. Usually, the answer will be yes or no. Either the character gets what he wants, or he doesn’t. Yes, Mr. Bennett introduced himself to the eligible Mr. Bingley on his daughters’ account. Yes, Mr. Darcy will return to find Elizabeth visiting his Pemberley estate. No, Elizabeth will not cave to Lady Catherine’s insulting demands that she refuse Mr. Darcy’s hand. This will then raise the secondary question: How did the character reach his goal? Or How was the character blocked from reaching his goal? Mr. Bennett anticipated his wife’s harangue and visited Mr. Bingley before she could each raise the subject. Just as Elizabeth is about to escape the premises of Pemberley with her aunt and uncle, she is surprised by Mr. Darcy’s return. Elizabeth refuses to give Lady Catherine her promise that she will not marry her nephew—and in so doing, discovers her love for him. The final part of this approach to scene structure is the “how.” How will Elizabeth respond to Lady Catherine’s unjust demands? The question reveals the goal. The “how” reveals the conflict. The answer reveals the outcome. This is not a competing system to Swain’s, but rather a bolstering one. Swain’s scene structure is scene structure. But looking at it from a slightly different angle is helpful in stripping scenes down to their bare facts, which then allows you to verify a single, solid, cohesive throughline in each scene. As you’re working through the six parts of Swain’s structure for each of your scenes, take an extra moment to also evaluate the scene through the lens of question and answer. This is a remarkably easy way to streamline scenes and keep them firmly on track, no matter how many layers of subplot conflict you have running through any given spot in your story. As a total bonus it also gives you a ready-made hook for the beginning of each scene. The hook itself is nothing more or less than a question. Pique your readers’ curiosity with this scene-driving question and you’ll pull them right through to the end of the scene—and hopefully into the next one as well. This does not mean you must always state the scene question explicitly. Austen never outright says, “Was Elizabeth about to give in to Lady Catherine’s bullying?” Usually, your best approach is to allow each scene’s question to arise from the subtext of the character’s goals and the obstacles they meet along the way. The very simplicity of this approach to scene structure makes it invaluable in cutting through the inevitable clutter while plotting a book. Use this question-and-answer approach to scene structure to immediately discover the heart of each scene, allowing yourself to then move onto the more complex issues of layering the blow-by-blow of the narrative itself. Wordplayers, tell me your opinion! What questions and answers frame your current scene structure? Tell me in the comments! Click the “Play” button to Listen to Audio Version (or subscribe to the Helping Writers Become Authors podcast in iTunes). Sign up to receive K.M. Weiland’s monthly e-letter and receive her free e-book Crafting Unforgettable Characters: A Hands-On Introduction to Bringing Your Characters to Life. K.M. 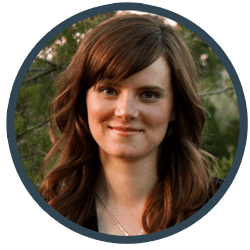 Weiland is the award-winning and internationally-published author of the acclaimed writing guides Outlining Your Novel, Structuring Your Novel, and Creating Character Arcs. A native of western Nebraska, she writes historical and fantasy novels and mentors authors on her award-winning website Helping Writers Become Authors. I’ve been really working hard at understanding and applying Swain’s model in a more organic way. As you mentioned in your book Katie, the scene beats could span more one than scene. I’ve also been initiating the scenes through different characters POV’s now and again to develop them all more fully. The goal is always easier to find, although, because I’m writing a thriller, the protagonist always seems to be seeking information so it’s been a challenge keeping that fresh with context and subtext. Inevitably, the outcome is either she gets the information or she doesn’t so that’s also been a challenge. Is the reaction in the sequel meant to reveal emotion and character and is that meant to be seen more in physical reaction, especially since screenplays are visually orientated? One way to think of scene and sequel is as “fast” and “slow” beats with the story. In the scene, something happens in a flurry of activity. Then, in the sequel, the character slows down to process it. Very often, this is where we’ll get an emotional response. However, this isn’t absolutely necessary. You can certainly write a sequel that just features a physical or logical response, but sooner or later, you’ll probably need to catch the readers up on the character’s emotional landscape. That makes a lot of sense Katie. I’ve realized that in certain genres we tend to race from scene to scene without giving characters breathing space to absorb, reflect, respond, etc. I think the absence of the sequel leads to flat, somewhat inhuman characters. I’m hoping that in time I can develop a well-oiled internal clock that can instinctively sense how the beats should fall; where the pace should be upped and where we need that personal breathing space. For now it’s just thump it out, assess it, adjust, repeat. Totally agree. Action w/o reaction ultimately endangers realism and suspension of disbelief. Honestly, good sequels are my favorite part of any story. Love this! Such a neat way of expanding the way I think about structuring scenes! Thanks for reading! Sometimes after you understand the complicated version, you get even more out of returning to slightly simplified approach. This was great! I’ve found Structuring Your Novel to be super helpful. But I’m finding the scene structure to be a bit more- difficult. I understand what scenes and sequels are, but I seem to have trouble applying it. I think the questions may help me, though there are times that I have issues differentiating the actual “conflict”. I might be taking it too literally… Does conflict with oneself count as a scene, or is that a sequel? It’s important to realize that conflict is nothing more or less than an obstacle to the character’s goal. It doesn’t have to be an altercation and it doesn’t have to be caused by another character. It could be a mud puddle in the middle of the alley that the character has to navigate without soiling her skirts. Ah ok! Thank you, that helps immensely. I think I’m studying a bit too hard lately. I have a habit of overthinking and I’ve read several articles on “Types of Conflict” and I know there are more than the ones they list. So oneself can definitely be an obstacle. Again, thank you! You give some very valuable advice! Yes, yes, yes. 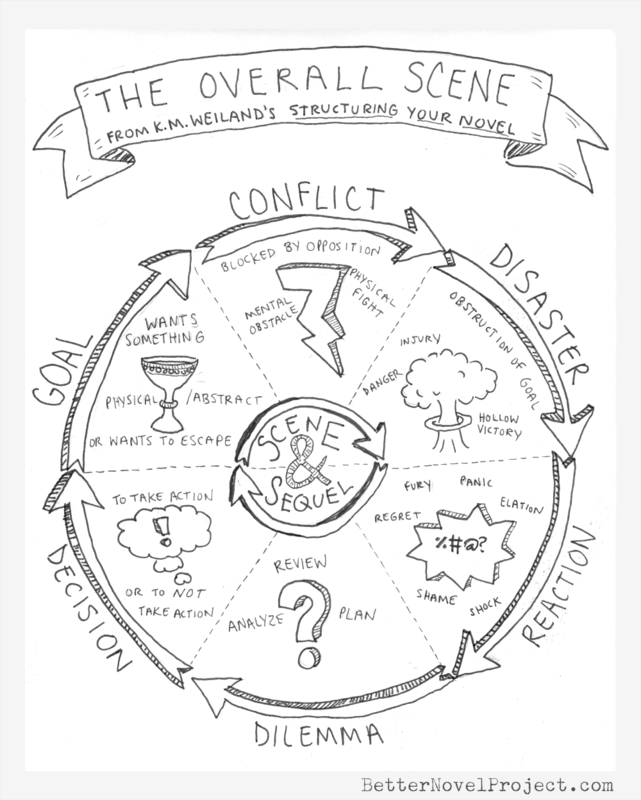 The scene sequel structure is fantastic…but it’s perfect for only about half of my scenes. This is a brilliant way to balance structure! Check out my latest novel! 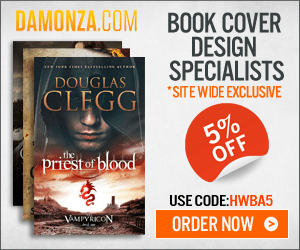 Join for Exclusive Access to New Books and More!